Matthew Wilson Slater (born September 9, 1985) is an American football special teamer for the New England Patriots. He played college football at UCLA, and was drafted by the Patriots in the fifth round of the 2008 NFL Draft. A three-time Super Bowl champion, Slater has made seven Pro Bowls as a special teamer (gunner). Slater is the son of former NFL offensive tackle and Hall of Famer Jackie Slater, and Annie Slater. He was born in Long Beach, California, and has a brother named David. He lettered in football for two seasons for coach Larry Toner at Servite High School in Anaheim, California, where he was teammates with Ryan Kalil. He was an All-West selection by Prep Star and a three-star selection by Rivals.com. He was also a two-time All-Serra League selection. As a junior, he made 23 catches for 333 yards and two touchdowns. As a senior, he made 39 receptions for 707 yards and five touchdowns. In high school, Slater was also a standout track athlete. He tied for second at the CIF State meet in the 100 meters, with a time of 10.62 seconds, and fourth in the 200 meters, with a time of 21.39 seconds. His 4 × 100 metres relay team was CIF champion. He was selected 2003 Orange County Register Boys Track and Field Athlete of the Year as a senior. He still holds school records in the 100 meters and 200 meters. Slater attended the University of California, Los Angeles and majored in political science and history, while playing for the Bruins football team. As a freshman, he redshirted due to a turf toe injury. In 2004, as a second-year freshman, Slater appeared in games against Illinois, Arizona, and Stanford. As a sophomore in 2005 he was reserve wide receiver. He missed the first three games due to a stress fracture in his left leg. He played in two games but did not make a reception. In 2006, as a junior, Slater played 13 games, including two (Washington and Arizona) on defense. He excelled on kick coverage, specializing in big hits on kick returners to help minimize kick return yardage. In the year, he made nine tackles, including six solo tackles. As a senior, in 2007, Slater played in 13 games and made 25 tackles. He also returned kicks for the Bruins. He returned 34 kicks for a 29.0-yard average and 3 touchdowns which tied the lead in the nation and set the UCLA record. He also tied the Pac-10 season record, set by Anthony Davis in 1974. His 29.0-yard kickoff return average was first in the Pac-10 and 12th-best in the country. He was First-team All-Pac 10 selection as the kick returner. His 986 kickoff return yards were also a new UCLA single-season record. Slater was drafted in the fifth round with the 153rd overall pick of the 2008 NFL Draft by the New England Patriots, who traded up with Tampa Bay before drafting Slater. Matthew's father, Jackie Slater, was pleased with the selection and told the Boston Herald that he received phone calls from "scouts, administrators in the NFL who knew me and my son, and they said, ‘Jackie, this could not be a better fit for your son to start being a pro football player.'" Slater was one of two players selected in the 2008 Draft (the other being Chris Long), and the sixth in the history of the NFL Draft, who is a son of a Hall of Fame member. Slater played in 14 games in his rookie 2008 season, returning 11 kickoffs for 155 yards and recording 12 tackles on special teams. In the 2009 season, Slater was active for 14 games for the Patriots, recording six tackles on special teams, while recording one rush for six yards as a wide receiver. He also returned 11 kickoffs for 269 yards, a 24.5 average. He had a career-high 35-yard kickoff return in the regular-season finale at Houston. Slater also played in a reserve role at wide receiver and on special teams coverage units in the postseason game vs. the Baltimore Ravens. In that game, he had two kickoff returns for 46 yards and one special teams tackle. In 2010, Slater did not record any offensive or defensive statistics, and did not return any kicks or punts, but he led the team with 21 special teams tackles in 15 games played. In the 2011 season, Slater was voted to be the Special Teams Captain by his teammates. Slater created a niche as a special teams force, leading the Patriots with 17 regular season special teams tackles in 2011; however, he had a presence in all three phases throughout the 2011 season. In the season opener against the Miami Dolphins, Slater made the Patriots’ first big play of the season catching a 46-yard reception from Tom Brady, (which remains his only career reception) and set the team up for the Patriots’ first touchdown of the season. Slater returned four kickoffs for 68 yards (average of 17.0 yards per return). He significantly contributed in the defensive backfield, and started in three games as safety. In his defensive start against the Indianapolis Colts, he forced a fumble and finished the game with a team high six tackles. In the post season AFC Divisional Playoff game, Slater had 1 special team tackle. Slater was selected for the 2012 Pro Bowl and the 2011 Pro Football Writers Association (PFW/PFWA) All-Pro teams including All-NFL and All-AFC as a special teamer. The Slaters are one of five active father-son families selected to at least one Pro Bowl apiece. The others are Gill and Jairus Byrd; Archie and Eli Manning; Archie and Peyton Manning; Clay and Clay Matthews; and Howie and Kyle Long. The Patriots reached Super Bowl XLVI, Slater's first appearance in the Super Bowl, but lost 21–17 to the New York Giants. Slater, who became a free agent after the 2011 season, signed a three-year contract to return to the Patriots in 2012. He was again voted as Special Teams Captain and voted to be the team's player representative to the NFL Players Association. He was named to the Pro Bowl and the 2012 PFW/PFWA All-Pro for the lone AFC special teamer position for the second straight season. In his sixth season with the Patriots, Slater continued to be a reliable captain and inspirational leader on and off the field. He had 14 regular season special-teams tackles, which was the second-highest on the team, despite missing four games early in the season due to injury. His on-field performance led to a third straight Pro Bowl nod. On November 26, 2014, it was reported that Slater signed a two-year contract extension to remain with the Patriots through the 2016 season. Slater, again, was voted All-Pro and to the Pro Bowl at the special teams position. It was his fourth straight selection to the Pro Bowl, and his 3rd All-Pro nod. Slater earned a Super Bowl ring as the Patriots defeated the Seattle Seahawks 28–24 in Super Bowl XLIX. On August 31, 2016, Slater signed a one-year contract extension with the Patriots through 2017. Slater continued to be a standout on special teams. On December 20, Slater earned his sixth Pro Bowl nomination. The Slaters now held the most Pro Bowl nods of an active father-son pair with 13. He was also named First-team All-Pro as a special teamer for the fourth time in his career. On January 4, 2017, Slater was announced as the winner of the Bart Starr Award, given annually to a player who exemplifies character and leadership on and off the field. His father received this honor in 1996, and together they became the first father-son pair to be honored with this prestigious award. Slater helped the Patriots finish with a 14–2 record. 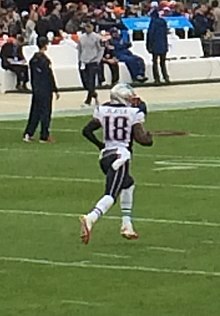 On February 5, 2017, Slater was part of the Patriots team that won Super Bowl LI. In the game, the Patriots defeated the Atlanta Falcons by a score of 34–28 in overtime. Slater had a role as special teams captain and successfully called the coin toss before overtime began. Slater was inactive for the first four games of 2017, recovering from a hamstring injury. He returned in Week 5, but missed Weeks 11–13 with the hamstring injury. Slater was named to a record seven consecutive Pro Bowls, which tied Steve Tasker for the most special teams Pro Bowl honors in NFL history. Slater could not play in the Pro Bowl because his team made it to Super Bowl LII. The Patriots failed to repeat as champions after losing 41-33 to the Philadelphia Eagles. On March 20, 2018, Slater re-signed with the Patriots on a two-year contract. Slater won his third Super Bowl when the Patriots defeated the Los Angeles Rams 13–3 in Super Bowl LIII. In 2013, Slater was awarded the New England Patriots 11th Ron Burton Community Service Award by owner Robert Kraft for his strong commitment to community service and leadership. Slater is one of the team’s most active community participants, regularly participating in the team’s organized community events. Slater is also the United Way representative on the New England Patriots, and is working with organizations in the greater Boston area to recruit one million volunteers[when?] as part of the wider Patriots Celebrate Volunteerism Campaign. On October 25, 2016, Slater hosted a "pop up" fundraiser to benefit Hurricane Matthew victims. He raised over $60,000 for Samaritan's Purse to assist in their efforts in the Carolinas and Haiti after the devastating hurricane barreled through those regions. Slater is a vocal Christian athlete, and often makes mention of his faith when addressing the media. ^ Connolly, Kenny (August 21, 2013). "NFL's Matthew Slater is making a name for himself". Orange County Register. Retrieved January 27, 2014. ^ "High Schools: Southern Section Football Roundup". latimes.com. September 22, 2001. Retrieved January 27, 2014. ^ "Records". servitehs.org. Retrieved January 27, 2014. ^ a b "Matt Slater". sports-reference.com. Retrieved January 27, 2014. ^ "Matt Slater". ucla.edu. Retrieved January 27, 2014. ^ Guregian, Karen (April 30, 2008). "Patriots' Slater makes dad proud". Boston Herald. Retrieved August 4, 2009. ^ Reiss, Mike (January 5, 2012). "Slater leads way on special teams". ESPN. Retrieved January 5, 2011. ^ Blakely, A.Sherrod (August 9, 2011). "Slater truly a special captain". New England Cable News. Retrieved August 9, 2011. ^ Scalavino, Erik (September 8, 2011). "Captains revealed, with some surprises; Thu. notes". New England Cable News. Retrieved September 8, 2011. ^ Kenyon, Paul (September 12, 2011). "Patriots Journal: Slater snares his first regular-season catch". The Providence Journal. Retrieved September 12, 2011. ^ "Matthew Slater: Career Stats". National Football League. Retrieved January 18, 2012. ^ Santoro, Tony (December 7, 2011). "Matthew Slater: Can He Be the Answer at Safety for the New England Patriots?". Bleacher Report. Retrieved January 2, 2012. ^ Reiss, Mike (December 27, 2011). "Patriots Pro Bowl analysis". ESPN. Retrieved January 2, 2012. ^ Author, None (December 27, 2011). "2012 Pro Bowl Rosters". National Football League. Retrieved January 2, 2012. ^ Staff, PFW (January 16, 2012). "2011 All-NFL team". Pro Football Weekly. Archived from the original on January 19, 2012. Retrieved January 18, 2012. ^ "2011 All-AFC team". Pro Football Weekly. January 17, 2012. Archived from the original on January 21, 2012. Retrieved January 18, 2012. ^ Price, Christopher (December 28, 2011). "Like father, like son: Jackie Slater ecstatic for Matthew's Pro Bowl berth". WEEI-FM. Retrieved January 2, 2012. ^ Patriots, New England (March 15, 2012). "Patriots re-sign WR Matthew Slater; Sign DT Marcus Harrison". Patriots.com. Retrieved March 21, 2012. ^ "Patriots Name Six 2012 Team Captains". CBS Boston. September 6, 2012. Retrieved October 9, 2012. ^ "Tom Brady steps down as Patriots' player rep, Matt Light also relinquishes role". Boston Herald. September 14, 2012. Retrieved October 9, 2012. ^ "2013 Pro Bowl Rosters: AFC, NFC". NFL. December 26, 2012. Retrieved December 29, 2012. ^ Arkush, Dan (January 10, 2013). "PFW/PFWA 2012 All-NFL team". Pro Football Weekly. Archived from the original on January 12, 2013. Retrieved January 15, 2013. ^ Howe, Jeff (January 2, 2014). "Matthew Slater discusses new role in breaking down team". Boston Herald. Retrieved January 8, 2014. ^ Yates, Field (November 26, 2014). "Pats extend Slater through 2016". ESPNBoston.com. Retrieved November 26, 2014. ^ Smith, Michael David (November 26, 2012). "Manning, Matthews, Slater following their fathers to the Pro Bowl". profootballtalk.nbcsports.com. Retrieved January 27, 2014. ^ Smith, Christopher (December 23, 2015). "Patriots' Matthew Slater two Pro Bowl selections shy of dad Jackie; 'I'll never be as good as my dad'". ^ Orr, Conor. "Matthew Slater inks 1-year extension with Patriots". NFL.com. ^ "Matthew Slater wins 2017 Bart Starr Award". Patriots.com. ^ King, Peter (February 6, 2017). "New England Patriots rally to win Super Bowl 51 in OT". Sports Illustrated. Retrieved September 2, 2017. ^ "NFL announces 2018 Pro Bowl rosters". NFL.com. December 19, 2017. ^ Wesseling, Chris (March 20, 2018). "Matthew Slater to re-sign with New England Patriots". NFL.com. ^ "New England Patriots win Super Bowl LIII". NFL. Retrieved February 3, 2019. ^ "Matthew Slater receives 2013 Ron Burton Community Service Award". Patriots. August 27, 2013. Retrieved October 9, 2013. ^ "New England Patriots Receiver Matthew Slater Announced as Local Member of United Way Team NFL". United Way of America. September 19, 2012. Retrieved October 9, 2012. ^ Laguarda, New Ignacio (September 24, 2012). "Patriots' Slater gets Waltham Boys & Girls Club kids pumped up for reading". Wickedlocal.com. Retrieved October 9, 2012. ^ "Matthew vs. Matthew: Matthew Slater hosts fundraiser to help relief efforts after Hurricane Matthew". Patriots.com All Access. October 27, 2016. Retrieved January 7, 2017. ^ Author, Anonymous (December 15, 2011). "Matthew Slater prays for Tim Tebow because 'he's putting himself out there on a limb". WEEI-FM. Retrieved January 18, 2012. ^ Paoletti, Mary (January 11, 2012). "Slater a fan of Tebow...the Christian". Comcast SportsNet New England. Archived from the original on July 23, 2012. Retrieved January 18, 2012.